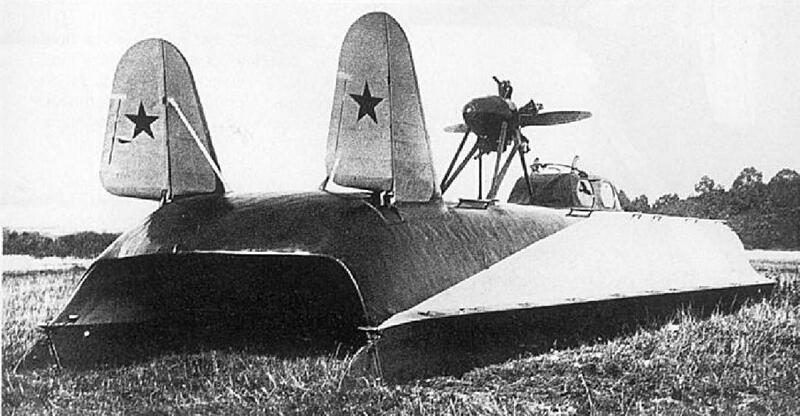 The first ever air-cushion vehicle L-1 before trials, the Pleshcheyevo Lake, Russia, October 1935. Pilot house cross-section of the L-9 fast attack craft, 1939. Performance trials of the L-5 fast attack craft, the Gulf of Finland, 1937. Assault hovercraft proposed by V. Levkov in 1935. The British engineer, Christopher Cockerell, is popularly considered to be the founding father of air-cushion vehicles. In June of 1959, his experimental hovercraft successfully crossed the English Channel between the ports of Dover and Calais. This historical event was given great publicity by the world press, however, it failed to acknowledge that the first hovercraft was actually launched in the Soviet Union long before Cockerell’s maiden voyage. In Russia, development of these unusual vehicles is associated with the name of Vladimir Levkov who was born in the industrial city of Rostov-on-Don in 1895. In the summer of 1921, Vladimir Levkov graduated from the Donskoi Polytechnic Institute (DPI) in Novocherkassk. Eight years later he was appointed professor at the Applied Aerodynamics Department. How did the young Levkov come up with the radical notion for air-cushion vehicle? Unfortunately, history does not provide us with any definite answers. He might have been inspired by Tsiolkovsky’s work, Air Drag and Express Train which was published in Kaluga in 1927 and immediately sent to the DPI library where Levkov spent much of his time. The young researcher set for himself a simpler and more realistic task. In 1927, he began research into the dynamics of air-cushion vehicles by testing a symmetric model, circular in plane, with a diameter of only 700 – 800 mm. His miniature model was built according to what is now referred to as a chamber configuration design. In 1932, trials of a new air-cushion vehicle model began. The new model featured an elongated, oblong shape, rather than circular one, and handsomely equipped with two prop engines—one mounted in the nose section and the other in the aft section of the hull. Tests of this model were also a success. Work was immediately begun for the construction of a larger model of craft which was about 2.5 m long. In retrospect, it seems that Levkov specifically pursued his air-cushion hovercraft to be used as a fast «flying» naval ship, for example, an attack torpedo craft. In May 1934, Vladimir Levkov was transferred to the Moscow Aviation Institute (since at that time the Novocherkask Aviation Institute was closed) where he became a professor of experimental aerodynamics. In December of that year Professor Levkov was put in charge of a specialized technical department at the MAI; here Levkov and his team began preparing blue-prints for the L-1 air-cushion vehicle. The first hovercraft was built at the Institute’s workshops and prepared for trials by the summer of 1935. The first prototype was a very simple design which consisted of two small wooden catamarans that were powered by three prop engines. Two M-11 radial aero-engines were installed horizontally in the funnel-shaped wells on the plat- form which connected the catamaran hulls together. The third engine, also an air-cooled M-11, was placed in the aft part of the craft on a removable four-strut pylon. Air cushion was produced by the horizontally-placed engines. On October 2, 1935, state trials of the L-1 air-skimmer (this was the official term adopted for the craft) began on the Pleshcheyevo Lake (the Jaroslavl Region, Russia). The tests lasted for 10 days. At that time nobody had experience in operating such vehicles. Overwater runs were performed using either two horizontal engines (with the pylon- mounted engine shut down) or all three engines running simultaneously. Trials were conducted in calm and windy weather, crosswind and downwind, over flat shore and swampy areas covered with sedge. Once the hovercraft’s engines failed and the vehicle landed in a deep swamp. However, soon the engines were restarted, the boat ascended and recovered itself from the swamp. The maximum speed of the first hovercraft was approximately 60 knots when powered by three engines, and 38 knots when powered by two. Trial results of this first prototype hovercraft were acknowledged as satisfactory. It was indicated in the report that the «principle for air-cushion vehicles has been proven feasible.» This report was approved by the Deputy People’s Commissar of Defense, M. Tukhachevsky. He wrote that the 1936 Prototype Construction Plan should encompass the production of two such skimming boats: one to be used as a fast attack torpedo craft and the other as a marine landing craft. Building on previously gained knowledge, a full-metal (duralumin) fast torpedo craft, designated L-5, was built in 1937. The craft had a good shape, glazed cabin, turret machine-gun mount and large tail fins. This was truly a unique naval boat. In the midship area there was a streamlined pilot house/cabin for the pilot and mechanic followed by a troop compartment and then by a turret equipped with a ring for a twin machine-gun mount. Torpedo attachment points were arranged under the center section in the dome space. The hovercraft could also carry eight depth charges. Over a distance of one mile, this hovercraft accelerated to a speed of over 70 knots (about 130 km/h). On March 11, 1939, by the order of the People’s Commissar of the Ship- building Industry, I. Tevosyan, Professor Levkov was appointed Head and Chief Designer of the newly established TzKB-1 (Central Design Bureau #1). Plant #445 in Tushino near Moscow, previously involved in glider production, was chosen as the new hovercraft production facility. Following the commencement of construction of combat craft, a need for the manufacture of training boats emerged. A training boat, designated L-9, soon appeared. It was designed for the training of its commanders, pilots, mechanics and gunners, and could also be used for liaison, patrol, ASW and troop landing missions. Despite apparent success, Vladimir Levkov realized that his hovercraft had some serious shortcomings. Both good and discouraging reports were coming from the Baltic Fleet, which had already received about a dozen of various types of air-cushion vehicles. The discouraging reports stated that pressure under the craft was low due to air escape through the vessel’s open extreme ends which reduced the craft’s load-carrying capacity; sprays produced by the powerful engines limited visibility; vessel’s operation was limited to sea state 4; the impact of the craft with waves changed the set- ting of louvers and occasionally dam- aged them. However, the main problem involved the aeroengines. In varying maritime conditions, they often sputtered and stalled when water penetrated into the exposed carburetors. And since the engines were positioned horizontally, they were not sufficiently air-cooled and would subsequently overheat if run for long periods of time. Arrangement of water-cooled engines in a row required the introduction of angled reduction gear units to drive propellers. Designers worked on these units, but the task turned out to be too complicated for the time. Finally, it was World War II which ultimately brought Levkov’s ambitious project to the ground. In October 1941, as enemy forces penetrated Russia, Levkov’s Design Bureau and Plant #445 were evacuated to Alapayevsk an old city in the Urals. Levkov was appointed Chief Engineer of the plant which was ordered to produce troop- carrying gliders. Hovercraft built before the war were assigned to the Baltic Fleet. In 1941, as the German forces continued their advance, all of these craft were transferred to the Kronshtadt’s Litke base and remained there until 1947. In 1947, they were considered obsolete and subsequently scrapped. The same sad fate took the only six-engine hovercraft. An attempt to transport it from Moscow to Gorky unfortunately failed. As fierce fighting approached Moscow, the unique craft was destroyed. From 1944, Vladimir Levkov held one of his positions at the Hydraulics Department of Moscow Food Industry Institute (MTIIP). In May 1952, he left the shipbuilding industry to start working permanently at the MTIIP as a professor, remaining a consultant of the Central Design Bureau involved in the development of hovercraft. On the eve of 1954, Levkov suffered an apoplectic attack at his institute and two days later, on the 2nd of January, he died of a haemorrhage of the brain. Vladimir Levkov was buried at the Golovinskoye cemetery in Moscow. This was just the time when Christopher Cockerell began experimenting with his first elementary hovercraft models. Leskov’s principle was not the same as Cockerell’s. Cockerell’s basic principle of the hovercraft was the generation of an air cushion having a pressure higher than ambient and bounded above by the under-surface of the craft and at the sides by a curtain system. Cockerell’s invention used an air curtain ejected downward and inwardly from nozzles extending around the whole of the perimeter – hence the term annular. This inward turning of the jet required a region of high pressure underneath the craft to deflect the air curtain outward so that it had a circular profile touching the ground, or water surface, before exhausting to the atmosphere. There is a 700 page book, with 450 pictures called ‘On a Cushion of Air’, (available through Amazon, The Book Depository and Kindle), which tells the story of Christopher Cockerell’s discovery that heavy weights could be supported on a cushion of low pressure air, and the development of the hovercraft by those who were there, from the very early days through to the heyday of the giant 165-ton SRN.4, which crossed the English Channel starting in 1968 carrying 30 cars and 254 passengers at speeds in excess of 75 knots on a calm day. It was subsequently widened to carry 36 cars and 280 passengers with an A.U.W. of 200 tones and was later lengthened to an A.U.W of 325 tons and capable of carrying 55 cars and 424 passengers. The amazing point was that from 165 tons to 325 tons only 400 extra hp was required, although a bit of speed was sacrificed, proving conclusively that Christopher Cockerell’s theory was sound. There is also a 1 hour 20 minute DVD based on the book available through Amazon Instant Video to rent or download in the US and Canada only. I bow to your specialist knowledge.